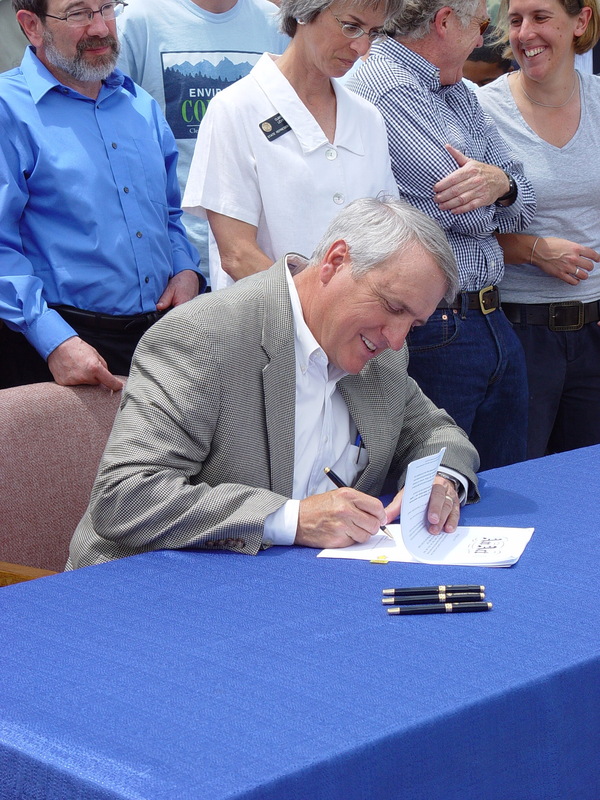 On an appropriately sunny Colorado afternoon, the Community Solar Gardens Act became reality. With the flatirons in the distance, Gov. Bill Ritter signed HB1342 into law June 5.
credited a single resident with the idea of community solar. The constituent mentioned that his neighbors in the mountains above Boulder have good exposure, but don’t necessarily have the money for their own system. He thought allowing panels on another owners property would help the mountain residents generate power for their homes. Levy looked into the law, and saw several impediments to siting solar panels off one’s own land. At the same time, Sen. Suzanne Williams, D-Aurora, was looking for a way for her constituents to own collaborative solar. They joined forces and carried the Community Solar Gardens bill. the new energy economy, and the 56 bills, of which Community Solar Gardens is the latest, that position Colorado as the national, and Ritter argues, international leader in new energy economies. the customers by allowing them access to benefits, from rebates to tax incentives, that homeowners get. The act also aids utility companies in achieving their state-mandated 30 percent renewable energy standard as customers sell excess power back into the grid. 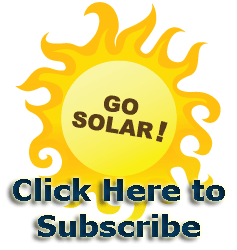 participate in Xcel’s Solar Rewards program to do so. “You have a lot of good ideas coming out of Boulder,” Eves said. The Community Solar Gardens act will allow people to own an interest in solar panels that are not on their property. Becoming part of a community solar garden brings clean, sustainable power to renters of homes, apartments or offices, condo owners, people with locations that are not ideal for solar panels or live in areas with homeowner associations that limit the number or location of panels. who own an interest in panels at a site. HB 1342 directs the Colorado Public Utilities Commission to create rules that require public utilities to extend rebates and other offers available to homeowners who install photovoltaic panels to these groups. One of the benefits for the utilities is more renewable power generated in areas where it is used and sold to the grid. State Rep. Claire Levy, D-Boulder, sponsored the bill in the House and State Sen. Suzanne Williams, D-Aurora, sponsored it in the Senate. bill at the federal level, the Solar Uniting Neighborhoods (SUN) Act, which will give federal tax rebates to solar panels hosted in solar gardens. For more information on Community Solar Gardens, visit www.solargardens.org. Renters, homeowners with shaded locations, and small businesses now have an option for generating and using solar electricity. Not every person has a steady place to keep their solar panels. Some have trees or buildings shading their roof, others live in apartments or rent a home. “Rather than just buying green power, folks can own part of a Community Solar Garden(TM),” Hughes said. With a solar garden, each subscriber’s electric bill is credited for energy produced by grid-tied solar panels hosted nearby, receiving an equivalent amount of energy from the grid. The Solar Gardens Institute supports the rapidly growing community energy movement. The Web site includes news articles, an extensive FAQ, and a list of applicable laws and local organizations by state. The Solar Gardens Institute will offer workshops and conferences on and off line, and help to ensure the organizational, financial and technical soundness of community energy facilities. The Institute’s headquarters in Westminster, Colo., has a roof-mounted solar array with 48 panels. Ten subscribers within the office building and the surrounding community will be able to purchase one kilowatt each of electricity. The Institute’s headquarters will serve as a test bed for software and best practices as Colorado prepares for larger facilities. It is managed by The Solar Panel Hosting Company, www.solarpanelhosting.com, which coordinates the development and management of solar gardens. Community Solar Gardens also support the rapidly growing sustainable energy industry in Colorado, bringing nontraditional solar panel owners into the mix. “The buzz surrounding Community Solar Gardens has aroused interest not only with potential subscribers and land owners, but with local installers as well,” said certified installer Doug Southard, owner of Southard Solar. To fully benefit from a solar garden, members will need to claim the 30 percent federal tax credit. U.S. Sen. Mark Udall, D-El Dorado Springs, has introduced the Solar Uniting Neighborhoods (SUN) Act (S. 3137) which will extend the tax credit for homeowners who purchase photovoltaic panels to those who invest in community solar gardens. The Solar Gardens Institute spearheads a national campaign to support this bill. Colorado passed a bill in the 2010 Legislative session allowing participants in Community Solar Gardens. Colorado joins Washington state, Maine, Vermont, and Massachusetts in allowing Virtual Net Metering. Remotely hosted solar panels are treated as if they are on the customer’s roof. The term Community Solar Garden has been used for two facilities in Massachusetts by My Generation Energy, www.mygenerationenergy.com, which has applied for a trademark. The bill gives state rebates to participants in solar gardens in the territories of Xcel Energy and Black Hills Energy. Projects are encouraged to include low-income electric customers. Under another bill, renewable energy credits will be doubled for community projects in Rural Electric Associations. Property-Assessed Clean Energy (PACE) programs are supported, enabling home owners to purchase a solar garden subscription secured by home value. At the county and municipal level, the Solar Gardens Institute advocates for zoning and permitting regulations that encourage mid-scale facilities near the point of use, larger than home solar but smaller than industrial-scale plants. “The Solar Gardens Institute is a community of communities, all helping each other go solar. Towns, citizens groups, solar companies and individuals all have a piece of the puzzle. Together we are finding a way to go solar that builds community wealth and protects sensitive landscapes.” said Hughes. The Solar Gardens Institute, which has applied for non-profit status, organizes communities to go solar by pooling their resources. Libraries and schools, churches and synagogues, businesses and citizens groups can benefit by hosting a distributed power plant where anyone can own solar panels. SolarGardens.org advocates for community based distributed energy at the federal, state, and local levels. Solar Gardens are self-organizing everywhere, beginning to transform America through solar power and people power.